They must be people who are born with "quite good heart" already. Seek to know why U must change your belief, rather. No evil heart. No fear. Why need to change? I do my cultivation in the markets. Pride, ego, greed, fear, ignorance, shame - I get to say hello to them one by one. Let me translate this Buddhist poke into the context you are more familiar with. Chit-chat small talk, how are you? Put on Sunday finest, cannot lose face. Question is, are you more "Christ-like" today than before? If not, how are you any different from an atheist? P.S. During my Alpha course, the group leader in charge of us (ex-business owner who sold business to take care of special needs son fulltime) said it best when I asked how to tell Christians apart for the pagans and heathens? Ya in our time now, Christians have it easy. In Roman's Empire time, if U professed your faith in Rome, U were quite certainly to be put to death. Burned alive or crucified. Yet the faith has lived and spread from then until today. Chinese like to say "Se du bu pah, pah se mok? So that should be the bottom line of Christian's faith. That's why I don't let myself get caught with "labelling". Calling oneself a "Christian" - that's a noun. But to be "Christ-like" in your actions... that's an adjective. No family's or any problems U face is greater than your life. I can understand what the business man did for his child. Life has a way of reminding us what's really important. Better to discover now than on our deathbeds! Christ-like I'm not sure, but being aware of my inner darkness counts? The poke is - to anyone of faith - if BEFORE and AFTER conversion we are still the SAME person, no change whatsoever, what's the point again? That means it has to manifest in our behaviour, speech, and actions that's VISIBLE to others. Who can see what you are thinking? Give you a concrete example. If we say we should love our neighbours, treat everyone like brothers and sisters, how does it look when we go online (anonymously) and whine about born and bred entitlements? How about if the foreign talent is a fellow Christian brother or sister? Will that change anything? Or you don't care? How much can U feel your food? How much can U feel the music? How much can U feel for a fellow being? How much can U feel His Presense? Do U have to ask someone? All man are born equal. Do we have a choice how we are born? One simple look around us the answer is self-evident - all men are NOT born equal. If we take it literally. "All men are created equal" is the most famous phrase in the US Declaration of Independence penned by Thomas Jefferson. The philosophers of the Age of Enlightenment had a big influence on that statement. Before that, the absolute power of the Monarchy and the dogmas from the Church ruled over the masses. Men were not created equal. Some had the Mandate of Heaven, some had monopolisitic access to Divinity. The Age of Englightenment is the foundation and well spring of the many democractic countries and separation of Church and State we see today. i maintain we are neither created equal not born equal in the first place since time in memorial. And nobody can do anything about it, ever. If not, we would be still singing "Ang moh tua kee" till today! Yes, chanting sutras does not help in "enlightenment". But its a great alternative form of meditation; to focus our minds on the here and now. Other faiths use the same technique too. Some sing; some do ritual dance. Kids are not burden by dependents and responsibilities so they can be free. Why FI? To be free from financial burden? Yup. Remember when we were young and "distracted" by a computer game, toy, TV programme, book? We lost all notion of time and space. Forget to eat, forget to do homework, forget to sleep... Until mom yells, "Go to sleep oredi!" Strip away your 10 baggers and "Ba Ba" CPF, who is CW? Do you feel naked and less of a man? Or is it really clothes make the man? This was what my late MIL who was on Buddhist and lifelong vegetarian told me when I mentioned 濟公 ate dog meat and drank wine and act crazy. She would reply she haven't reach the level of 濟公 so she had to follow forms of Buddhist including being vegetarian. 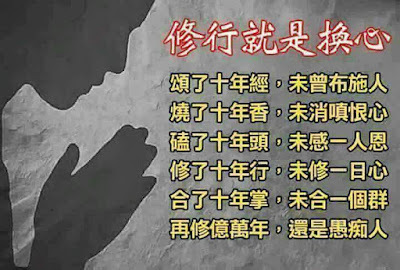 濟公 is living Buddha and very powerful who can save himself from whatever troubles and can escape whatever punishment. He could do what he like; but she couldn't. She followed forms so she would have hope too as Buddhist. I can! You can! Chun bo! Remember your first year at your last company? Everything by the book and follow procedures right? Was your last year before retirement still the same? No right? New follow the cookbook religiously. 1 teaspoon is 1 teaspoon; 5 ml is 5 ml. Once we know how to cook, everything goes by "feeling" agar agar!? LOL! Of all places, I think this is the last place to hear me say, "I can; so can you!" i think kids are most lovely before we adults bring them into our corrupted world. Let them be, as long as suitable for each individual kids. Meanwhile, enjoy their innocence as parents because before U realised it the kids are teenagers. The time of entering into "danger zones" for them. Where peers, society influence, etc... are battling with parents's influence. This is very crucial and critical times. I learnt to be less judgmental. I had to eat my own words, and pull my foot out of my mouth so many times, that now I always leave a backdoor open so I can beat a hasty retreat! 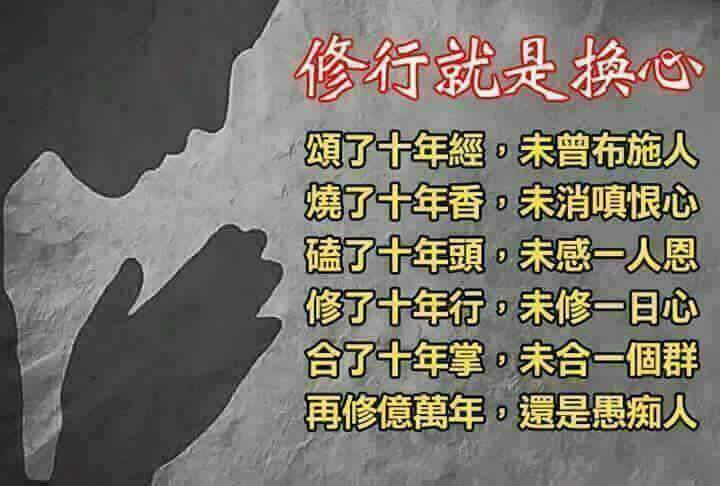 I've learned that 话不可说太快. It can come back to haunt. Was trying to teach a xiao mei in office that utmost care has to be taken while writing papers. No "results in", use "seems to suggest/it could be inferred"
Same like a certain "investment newsletter": the stock price could go up, down, or stay the same. Safest answer ever! In trading, we say if STI can break 3250, then positive momentum may carry us to 3350 and beyond. But if STI breaks 3100, that may put 3000 in view. Look! Anyone and everyone can write trading newsletters! Same like "I will never" and "I will always." People change. Things change. Circumstances change. If I can't be famous, I'll aim to be infamous instead! And that's when I'll do what you prefer - stick my neck out! There is such too much of a good thing is not a good thing. Or K too ho, mine KK. And I like this saying or thinking. Before the age of 4 or 5, Kids worship their parents like God. I still can remember how people stared and maybe envied my 3 to 4 year-end old son, "worshipping" his mother. Time passes very , very quickly, really. If U reminiscing the good old days. As a piece of white paper, we thought the first investment "guru" we came across as the best thing since sliced bread! Just take Rich Dad, Poor Dad. So inspirational! It changed my paradigm! Once we have walked the path a little longer, we soon realise its "fluff", at best light weight material. That's about it. Don't get me wrong. Its great for its purpose - reaching out to beginners.